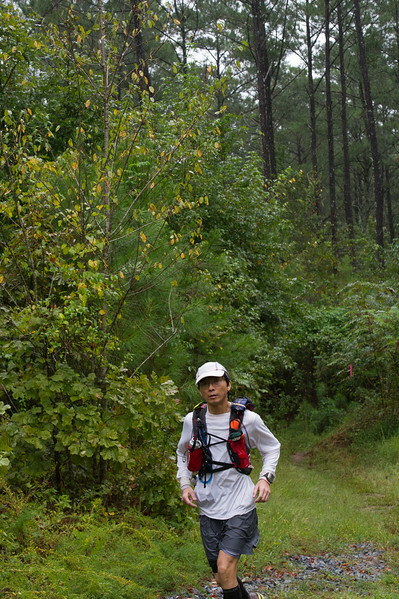 I decided to take pictures of this 100-mile race again this year. I wanted to get sunrise pics on top of the mountain, but it was raining buckets at sunrise and that didn't work out. This was at about mile 30 later in the morning. Still pouring rain, so I had to park the truck where I could take pictures from inside. This was the best spot I could find. They had the 50 milers coming from the opposite direction so at first all I saw were the backs of people. Those are the 50 milers. Anyway, I hope they all finished safely! They're crazy, but they're awesome!